A lot of people are taking protein supplements and powders with the idea that it will help them lose weight, while many other people start consuming protein powders in their teenage sporting years, and don’t stop. However, few people in the U.S. aren’t actually getting enough protein, with a typical non-exercising adult only needing around 60 grams per day. And while there are no studies to prove that excess protein is harmful in the short term, consuming significantly more than you need (taking exercise levels into account) can lead to kidney failure, osteoporosis and heart disease in the long term. What happens is that unused protein ends up breaking down into urea and acidic byproducts which strain the kidneys and can trigger the bones to release calcium. Recent studies have also found that excessive amounts of protein cause inflammation and increase the likelihood of clogged arteries. A study this year by the non-profit Clean Label Project of 134 protein powder products from 52 brands found that 70 percent had detectable levels of lead, 74 percent contained cadmium and 55 percent contained BPA. The levels found were 1.5 to 4.8 times higher than organic protein products would contain. BPA is known to cause cancerous tumors and birth defects, and lead affects the development of the brain and nervous system in children, and in adults, can cause long-term damage such as high blood pressure and kidney damage. Cadmium can negatively affect how the body uses certain nutrients, thereby affecting the immune and musculoskeletal systems. For your reference, the worst tested products were Vega sport protein, 360Cut Whey Chocolate performance supplement, Quest chocolate milkshake protein powder, Nature’s Best ISOPURE creamy vanilla and Garden of Life Organic Shake and Meal Replacement Chocolate. Tests have found that just 21 percent of protein supplements contain the ingredients they claim to, meaning you aren’t necessarily going to get the benefits promised on the packaging. Often people purchase their protein powders based on the marketing, and aren’t aware of the unlisted ingredients, like stimulants or even steroids. In one sense, it can feel like you have all the control in the world when you can measure your protein consumption by the teaspoon. However, a lot of store-bought protein powders contain added oils, sugars, probiotics or amino acids, which can mean you are consuming even more calories — possibly leading to weight gain. There are some legit reasons for making your own protein powder. As already mentioned, it might be the easiest way to take what you need with you to work, on a hiking trip or while traveling. Growing teenagers and people aiming to build muscle can benefit with a bit of extra protein, as can those recovering from an injury or going vegan. But, rather than relying on the overly unreliable commercial products, why not make your own? It will be somewhat less concentrated, but there’ll be no surprise ingredients and it will be more affordable. Take one of these combinations below, and put the ingredients together in your food processor and grind the mixture into a dense powder. Play around with the ratios according to your taste, then use the powder with water or milk for a shake, or add it to a fruit smoothie, salad or soup. Hey Buddy!, I found this information for you: "4 Dangers Of Store-Bought Protein Powders And Supplements (And How To Make Your Own)". 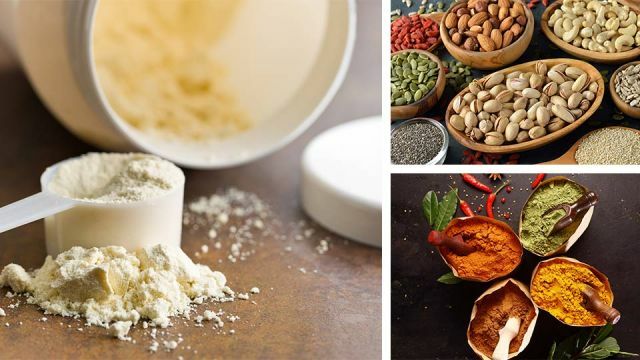 Here is the website link: https://www.thealternativedaily.com/4-dangers-of-store-bought-protein-powders-and-supplements-and-how-to-make-your-own/. Thank you.